The first Nanney reunion was in 1908 at the North Carolina home place on Nanneytown Road in Rutherford County. There was much conjecture about the Nanneys who came to Virginia from Nannau, their ancestral home in Wales. Speculation continued to grow. Annual reunions started at Round Hill Baptist Church in Union Mills, NC, in 1983, and there was increased attention to genealogy by several Nanneys from New York to Texas, including Wade Nanney, Sue Nanny King, Lynn Fussell, Irna Eckert and her niece Christine, Jack Nanney, Cedric Wilkerson and many others. In 1985 the Rev. Charles Nanney ignited interest with a slide presentation of his trip to Wales to see Nannau. (This photo was taken south of the settlement of Llanfachreth, founded in 1100 for a colony of serfs near the Nannau estate. 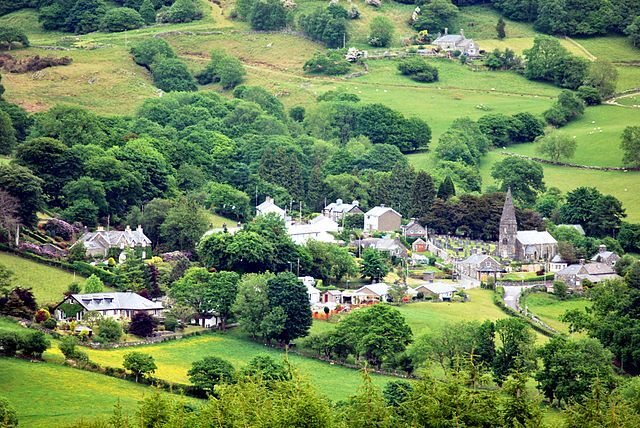 It sits on the slopes of the Mawddach River valley at the foot of Moel Orthrwm.) In addition to travel photos, Stancill Nanney of Atlanta offered information that he had researched, but there seemed to be a mysterious hole in the Nanney lineage around 1650. A flurry of letters (not e-mails) went back and forth among cousins in 1997. Bit by bit they built on the information compiled through a Welsh genealogist, Mr. O.E. Ruck, hired in the 1920’s by Mrs. Temple Hill Carraway. They sought assistance from the Mormon Genealogy Library in Salt Lake City, or contacted The National Library of Wales or the Gwynedd Family History Society in Wales. They visited county libraries and museums and archives. All before the internet. Since that time, Mary Glenn Loveday, daughter of Addie Nanney Burgess, has spent many years collecting articles and interviewing family members with the intention of combining research that existed in different pockets of the clan. Hers was a lofty aspiration since one article from her library alludes to over 700 descendants. Mary Glenn’s reports continue the Nanney saga, and earlier “It was widely believed that Robert’s eldest son Samuel came south to Virginia, married a Chickahominy Indian and had a son, John Wyatt Nanney, Sr.” But there was no documentation. According to notes from the Cator family investigation, Robert Nanney of London immigrated to Massachusetts in 1635 aboard the ship HMS Increase. Robert became a successful merchant, and at a young age owned property in Maine, New Hampshire, the West Indies, Jamaica and Barbados. I must put in a footnote here for poor Catherine. What does a gentrified widow with young children do? She herself was young, thirty-three by my math. In the mid 1600’s in Boston she was vulnerable, and succumbed to the advances of a “truck-master” for the Penobscot Fort in 1666. Edward Naylor did not appreciate his advancement to successful merchant when they married. And Catherine came to her senses when her husband’s mistress got pregnant. Or maybe it was when he tried to poison her. Nevertheless, Naylor was banished from Boston and later bought off by her brother Samuel Wheelwright of Weels, England. Some say that Boston’s construction of a ten-lane three-and-a-half mile tunnel (The Big Dig) is the most expensive highway in the US. It was governed by a 1966 National Historic Preservation Act required of major federally-funded highway projects. In a 1999 article by the Associated Press, prior investigative successes were cited. “Excavation of a shell heap on Spectacle Island in Boston Harbor revealed that American Indians came to the island by canoe 1,500 years ago to spear fish, clams and mussels.” Really? “The remains of a wharf were found beneath a parking lot along the Charles River.” Who would suspect? And now this “highway construction project has unearthed what archaeologists call one of the most important historical discoveries in New England: a 17th century outhouse that is providing new information about the diet of Colonial Americans.” This excavation is “possibly the most significant urban Colonial-era find in North America,” said Bob Hasenstab, chief archaeologist on the project.” The scientists discovered the early settlers ate “more native fish and fruits than was originally thought.” Wow, that’s news? Our tax dollars found a 6’ hole lined with a double wall of bricks 6’x10’now filled with “unwanted artifacts” like a clay pipe. I mention it because the waterfront home was near the wharves, and it had belonged to our girl Catherine Nanney. I want to imagine her on a widow’s walk viewing the graceful sailing ships that came into Boston Inner Harbor to exchange cargoes, mourning her husband and waiting for her son Samuel who took over the family shipping business. Ironically, the day after I wrote this, I was talking to a neighbor in NC who said he and his wife used to live near Charles River and Paul Revere’s Old North Church years ago. He told me about an underground tunnel used for pirate contraband. So now I have another story to write!!!! I don’t know why I went off on that tangent. It seems I like to trace a thread that is woven into a pattern instead of admiring the fabric. According to an archaeology map done for The Big Dig in Boston, Catherine Nanney Naylor’s house was a couple streets over from a home built by wealthy merchant Robert Howard on the site of the Second Church parsonage occupied by Cotton and Increase Mather. The parsonage was destroyed in the Great Fire of 1676. 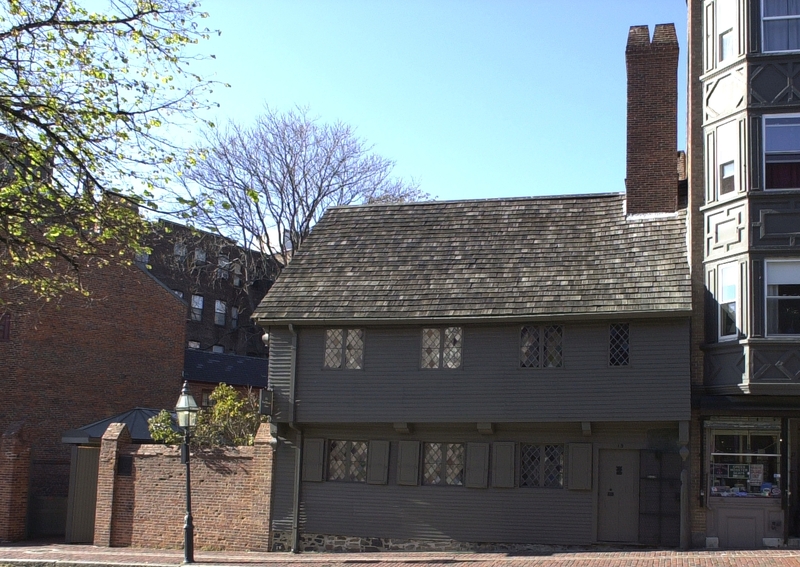 The new house was purchased ninety years later by Paul Revere! I don’t know what happened to the other outhouses. I have a subscription to Institute of Archaeology ‘zine, and I will keep you posted. And I digressed with my thread pulling. Loose threads aggravate and pull me away from my goal to find the elusive son of Samuel Nanney of 1670. He needs to be a John Wyatt Nanney, Sr. I’ll take a break. This entry was posted in Characters, Nanney Saga, Uncategorized and tagged Catherine Wheelwright, Nanney Research, Robert Nanney, The Big Dig. Bookmark the permalink. Interesting piece about the Nanneys. I started nannau.com about 6 months ago (I live within walking distance of the house in Wales). I’ve put a link to this page on the home page. Welcome, Ian. And thanks for connecting my site to yours. I will do likewise. I look forward to reading about your side of the story! I find all this very interesting. I was born Kristen Elise Nanney in 1979. My father is Ronald Gene Nanney born in1954 and his father was Jerry Lee Nanney unknown dob and, his father was Charlie Cleveland Nanney. I’ve only just begun my search and everything I find intrigues me. Welcome Kristen, I hope you find connections here. As soon as I get a definite date for the Nanney reunion in August, I will post it. I am searching for Nanney links. I am descended (I believe) from Robert ap Hugh Hen and Robert (‘Jr’) and Catherine Wheelwright. My father’s gg grandmother was Sarah Nanney c. 1827. I am curious if you have made any progress in the last few year documenting Samuel’s son, John? Just learning about my ancestry! My dad was Harold Eugene Nannie born in 1925 in Dyersville Tennessee to Wylie and Anne Miller Nannie. Our family now lives in Monterey, California. My dad left Tennessee to join the Army, retiring here in Monterey. Is the reunion scheduled in August 2018? Best wishes for getting in touch with your roots. Hi Debbie, I would like to provide assistance in your Nanney search. It seems as though you already have a lot of information, but I don’t see a location noted for any person. As there are Nanneys all over the country, it would help if you had a Union Mills relative or at least a descendant from Shadrack Nanney who settled here in 1798 from Brunswick County, Virginia. Shadrack, his wife Mary Cobb Wright, and two brothers Jordan and Nicholas settled in the Cathey’s Creek area along what is now Nanneytown Road. I do find Sarah Harville in a list of Shadrack Nanney’s children in a geneology of W. Worth Nanney written by Frank Nanney. The entry reads that the 7th child born to Shadrack Nanney and his second wife Mary (Polly) Wheeler was John Nanney (March 15, 1815 to September 19, 1887. He married a Sarah Harville on August 17, 1843. There were nine children all together. One of John’s brothers, Thomas Nanney, had a child William Nanney who died in the Civil War in 1862. He was married to Nancy Jane Sorrells in 1857. I hope this helps in your census search. I was at Oxford from 1956-1959 during which time my girl friend was Molly Vaughan, then a student at secretarial college (I think). I spent a year (1959-1960) doing post-graduate studies at Iowa State University during which time I had a substantial correspondence with Molly, I had attended her 21st birthdav party at Nannau staying the weekend at the Harlech house of Richard Hughes, author of High Wind in Jamaica, On my return from the US I was desolated to learn that Molly had got engaged to a stock-broker.. She was tall, lovely, and very funny. 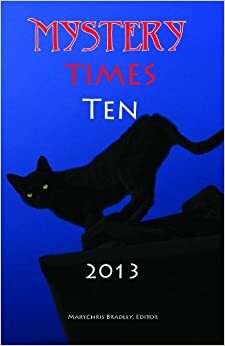 I became a novelist, had 4 children, and have just celebrated my 80th birthday. Is Molly still around? I do hope so. And if so hoi did her life pan out? Thanks for the message, David. Sorry it took me so long to reply. I’ve been busy selling books! I know you understand. I hope you will get a response from Molly or somebody who knows her. I will contact a couple people who might give you information. All my best!